Do you know how much your office is printing? You may be concerned about the amount of printing being done by people in the office. But how can you possibly keep track of how many pieces of paper are going through the printer daily, let alone by whom each time. Even someone who can keep perfect track of how many reams of paper and packs of toner have been purchased will not be able to accurately track printer usage without a lot of effort. Thankfully for offices like these, there is Caltronics Business Systems. Through managed print services and countless other great services and products available, Caltronics can revolutionize the way that you track your printer’s usage. Managed print services mean that Caltronics works with you to keep track of printer usage. You will get detailed information on how often consumables including paper and toner were used, what type of jobs they were used for, how often copies, scans, faxes, etc. were made, and much more. Variable data printing is a revolutionary technology that is offered on the highest-quality Konica Minolta brand multi-function printers that are offered and serviced by Caltronics Business Systems. Variable data printing allows users to easily print out documents with similar formatting but each with unique pieces that are easily created and taken care of by the printer itself. For instance, if you need to print invoices for all of your clients with their unique addresses on them, variable data printing cuts down on the steps it takes to transfer all of the different names and numbers onto the template invoice. This saves a ton of time for any office that handles invoices, marketing, mailing, and more. Variable data printing can also help cut down on your amount of printing by reducing printing errors while trying to print a large load with a lot of unique names or other variables. You will no longer have to run back and forth from the printer and your desk to make sure that everything is printing properly. The Konica Bizhub touchpad lets you take care of the job right on the printer itself. This entry was posted in Konica Minolta and tagged Caltronics, Caltronics Business Systems, managed print services, Variable data printing on November 23, 2016 by riehlt. Just reading the word “paper jam” might make you shudder if you’ve worked in an office for any amount of time. If your office is equipped with a Konica Minolta Bizhub, you already know how reliable it is. But misfires do happen. Luckily, your Bizhub makes it as simple as possible to identify paper jams and get back to the job. All you have to do is follow these five easy steps. 1. Determine where the paper jam occurred. The display should indicate this information for you. There are three main areas where papers misfire: the document feeder, the paper drawers, and the side compartment. A misfire in the document feeder could mean that papers weren’t properly aligned before you tried to make a copy, while an issue in the paper drawers might have been caused by paper in the trays not being inserted correctly. However, the most common place to find jammed paper is the side compartment where the actual imaging happens. Press “start guidance” on the control panel. This can also show you visual step-by-step instructions when you experience a paper jam. The display will zoom in on the part where the Bizhub senses the paper jam and show exactly what to open. Press in the gray button on the right side of your printer to open up the compartment. Usually the paper will be visible immediately. Remove any paper you see. Simply lift the document feeder and remove the paper if it was a jammed copy. Open the paper drawers and make sure there is no paper caught in the feeder. 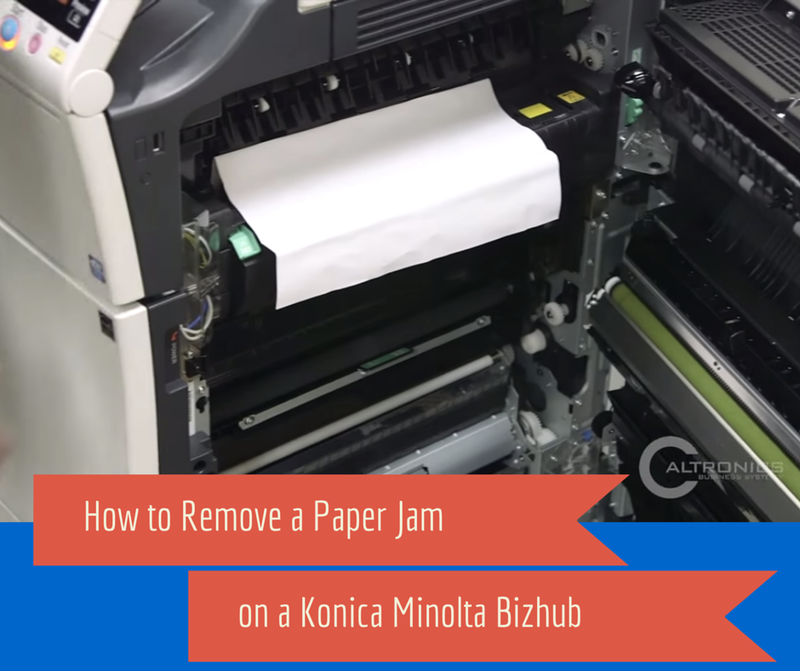 While paper jams are inevitable when dealing with printers, the Konica Minolta Bizhub used frequently by Caltronics allows you to quickly and easily correct the issue and proceed with your printing project. This entry was posted in Konica Minolta on June 25, 2015 by riehlt. If you work in an office or own a business with old or shoddy printers, chances are you could very easily rattle off a big list of printer problems you experience often. Konica Minolta’s BizHub series of printers is leading the industry in ways to solve the many printing issues that can plague an office environment. These printers will stop the productivity delays and wasted money that other printers cause. Below are four problems that switching to BizHub can immediately solve for your office. Losing money on outdated technology. An inefficient printer can cause many issues that lead to your business losing money. Printers are essential to your office regardless of the type of business, so why stick with an old printer that breaks down when you try to print 10 pages? BizHub printers, outfitted with high-tech improvements on the inside and out, will remove the frustration caused by old printers. Excessive worrying about printing. 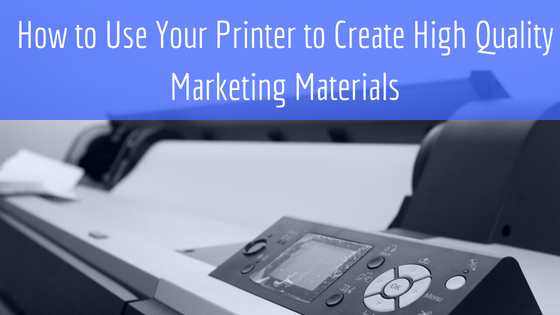 If you have an ordinary printer, you probably have experienced issues when trying to do large print jobs, such as paper misfiring, constantly needing to refill the paper tray, or overheating. BizHub printers are equipped with the best technology to ensure that any-sized print job is completed quickly and without error. Even some of the most compact of the BizHub line has a maximum paper capacity of 850 sheets, letting employees be more productive without worrying whether their print job is going to stop half-way through. High impact on the environment. BizHub printers come out of the box with solutions to ensure that your office is green-friendly through better and more efficient equipment and printing. Many printers are even made with recycled materials. Less energy and resource consumption not only helps the environment, but it also helps you save money. Lack of cohesion with technology. With BizHub, you can eliminate onerous tasks and difficulties with communication by using BizHub Connector. With BizHub Connector, you can take advantage of Microsoft SharePoint, Google, or Evernote for a more efficient and safe environment to keep documents. This service allows you to scan directly to cloud services on users’ computers, print from your cloud service, and utilize security options to keep all of your documents safe. This entry was posted in Konica Minolta and tagged bizhub, printer problems on June 10, 2015 by riehlt.